First off, Welcome to the new look of Chef in Training! I think you might find it easier to navigate through to find what you are looking for! Under the recipes tab you will find a text version of the recipe index and the new VISUAL recipe index for you visual people! I absolutely LOVE the new make over! Due to the switch over yesterday, the Tuesday Talent Show will return next week. To make up for the lack of link party, I have an awesome recipe that you all are going to love! The Cake Batter Craze continues. I am pretty much in love with the stuff! This recipe combines two great creations and make them even more fabulous. Let me introduce you to Cake Batter Monkey Muffins. Heaven Sent. These bad boys are the perfect size and the right dosage of sweetness! My whole family love them and I couldn’t get over how stinkin’ easy they are to make! Wow! These look so yummy! I love all these cake batter recipes. Hope you're husband is doing well! Wow! I think I'm going to have to go pick up some jumbo biscuits and cake frosting! MMMMM! I love the new look, it's beautiful!!!!! Your cake batter monkey luffins look amazing! I am so making these!! You had me at Cake Batter! And LOVED meeting you this weekend. You are too cute! Heck yeah!!! Those sound amazing. Your new look is pretty amazing too! Congratulations on the new look for the website! This recipe is so easy even I couldn't mess it up, and it sounds delicious. I will be trying this today. Thanks. Hello !! Love your website, however I am not able to get your Cake Batter Monkey Bites to Pin in Pinterest.... The link must be broken because I am able to "Pin It" some other recipes. Too awesome!! Anything with cake batter is a winner in my book. Very creative! 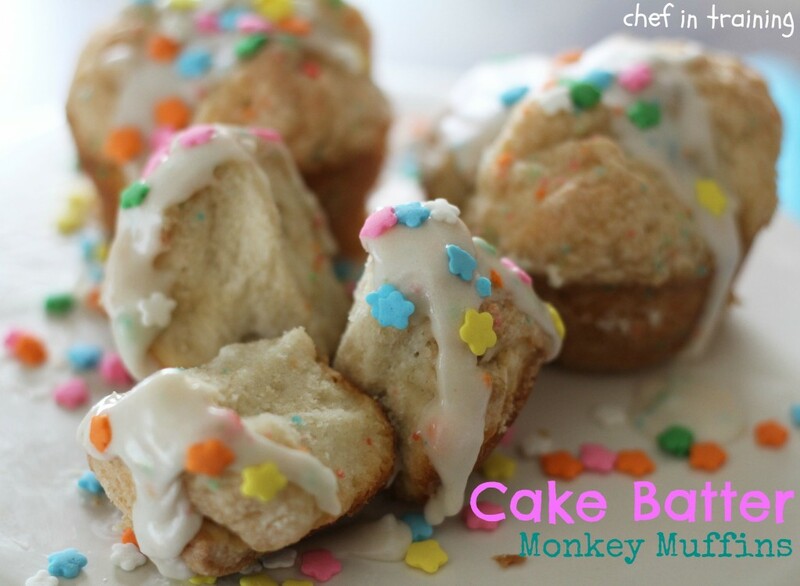 Cake batter in the form of monkey muffins? That might just be the best thing ever! These cake batter monkey bread muffins are amazing!! I made them last week and everyone raved about them! Amazing recipe and simple! This is definitely a keeper!! These look AMAZING! Cannot wait to try them...tonight :-) Thanks!